Received 25 March 2010; revised 5 May 2010; accepted 7 May 2010. 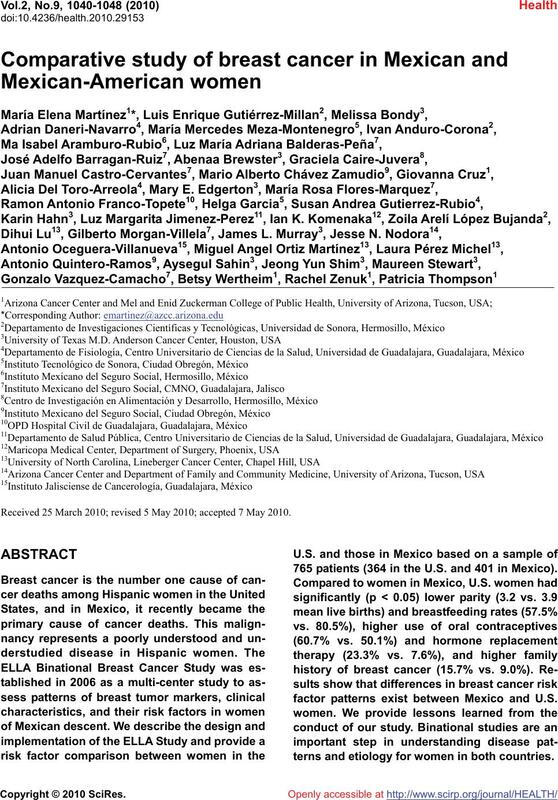 765 patients (364 in the U.S. and 401 in Mexico). factor patterns exist between Mexico and U.S.
terns and etiology for women in both countries. 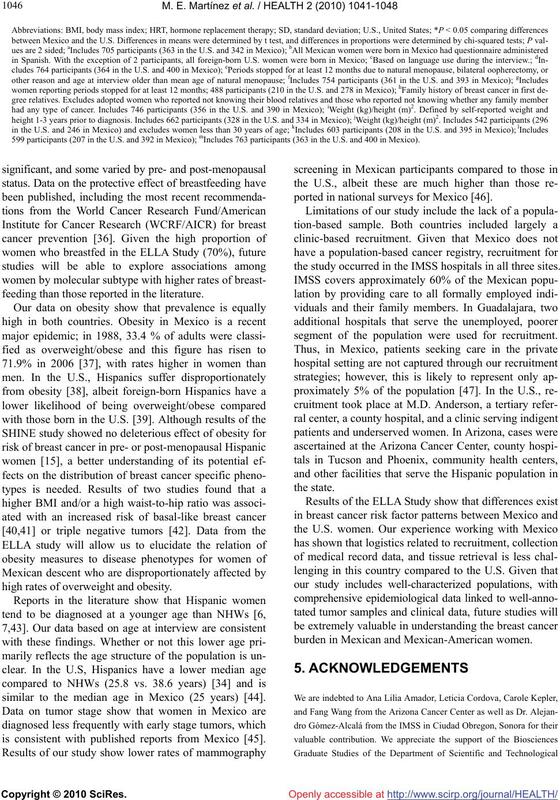 basal-like breast tumors in Hispanic women in the U.S.
receptor 2 (HER2), compared to NHWs [28,29]. ted with breast cancer and its subtypes. and Instituto Jaliscience de Cancerología in Guadalajara. consent was obtained for all participants. ticipants were self-identified as being of Mexican descent. of identifying patients differed by region (see Table 1). for Mexico. No differences existed between the two U.S.
versions and only minor differences between the U.S.
and Mexico questionnaires (see Table 2). to undergo quality control verification. Table 1. Recruitment sites in the ELLA study, March 1, 2007 to June 1, 2009. Center (Nogales); Regional Center for Border Health (Yuma). Houston, Texas (United States) M.D. Anderson Cancer Center; Lyndon B. Johnson Hospital; The Rose Diagnostic Clinic. Ciudad Obregon, Sonora (Mexico) Instituto Mexicano del Seguro Social. Hermosillo, Sonora (Mexico) Instituto Mexicano del Seguro Social. Table 2. Characteristics of the risk factor questionnaire and the medical record abstraction in the ELLA study. religious preference, income (Mexico only), parents’ place of birth, poverty index (Mexico only). Occupational history Longest paid job held for one year or longer; farm work. Pesticide exposure Exposure at home, residence in or near agricultural community. Tobacco Exposure Cigarette use status (never, past, current), dose, and duration. Second-hand smoke exposure history. Alcohol History Alcohol use, type, dose and duration. Menstrual history Age at menarche, menstrual cycle regularity. Age at menopause and type. Pregnancy history Age at pregnancy, number of full term pregnancies, type of birth, breast feeding, weight gain. Breast health history History of breast self exam, clinical breast exam, mammography, biopsies. Method of breast cancer detection, symptoms, delay in care, reason(s) for delay. bladder disease, radiation to the chest. Medication use Use of aspirin/nonsteroidal anti-inflammatory drugs and oral corticosteroids, dose, and duration. use Type of birth control and history of use. HRT use, type, and duration. Family history of cancer First and second degree family members, type of cancer, and age at diagnosis of affected family member. spent sitting and sleeping). Activity level at various ages during lifetime. Anthropometrics Height, weight, and weight history. Waist and hip measurement. Medical Record abstraction Site of recruitment. Age at diagnosis. Stage, histology, tumor markers (ER, PR, HER2). population as well as by country. portions of English and Spanish speakers in the U.S.
higher in the U.S. than in Mexico. front end using Secured Socket Layer certificate. tinued growth of the Hispanic population in the U.S.
marker profile for this underserved population. the cultural impact of the adoption of U.S. lifestyles. Table 3. Characteristics of participants in the ELLA study, March 1, 2007 to June 1, 2009. 599 participants (207 in the U.S. and 392 in Mexico); mIncludes 763 participants (363 in the U.S. and 400 in Mexico). feeding than those reported in the literature. high rates of overweight and obesity. similar to the median age in Mexico (25 years) . is consistent with published reports from Mexico . ported in national surveys for Mexico . the study occurred in the IMSS hospitals in all three sites. segment of the population were used for recruitment. burden in Mexican and Mexican-American women. Research of the University of Sonora. Parkin, D. M. (2002) Cancer incidence in five continents. Lozano-Ascencio, R., Gomez-Dantes, H., Lewis, S., et al. Caribbean (Spanish). Salud Publica de Mexico, 51(Suppl. 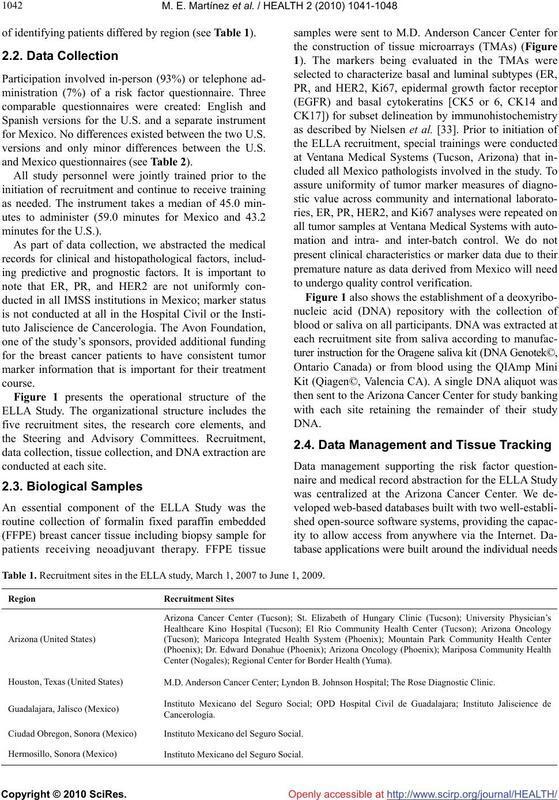 Knaul, F.M., Arreola-Ornelas, H., Velazquez, E., et al. Publica Mexico, 51(Suppl. 2), S286-S295. Cancer Journal for Clinicians, 56(3), 168-183.
and survival among breast cancer patients under 35. Journal of Epidemiology, 155(6), 534-545. 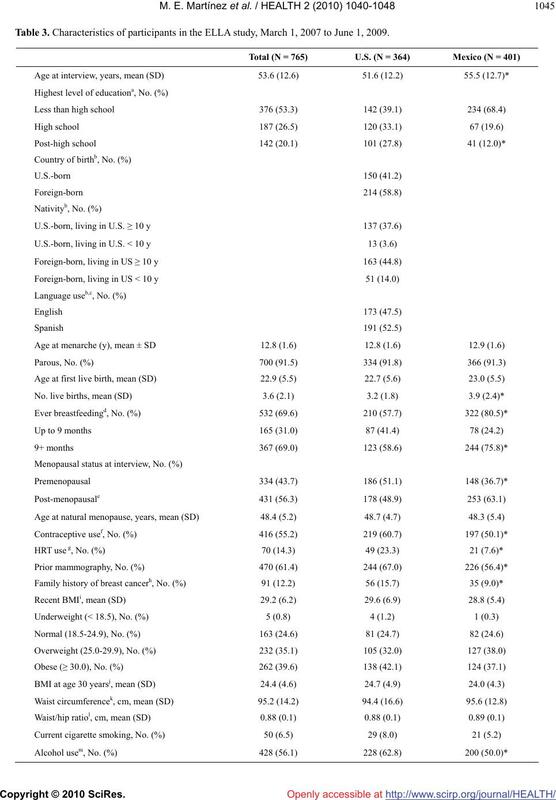 Journal of Public Health, 96(12), 2173-2178.
and Underserved, 18(Suppl. 4), 130-145. 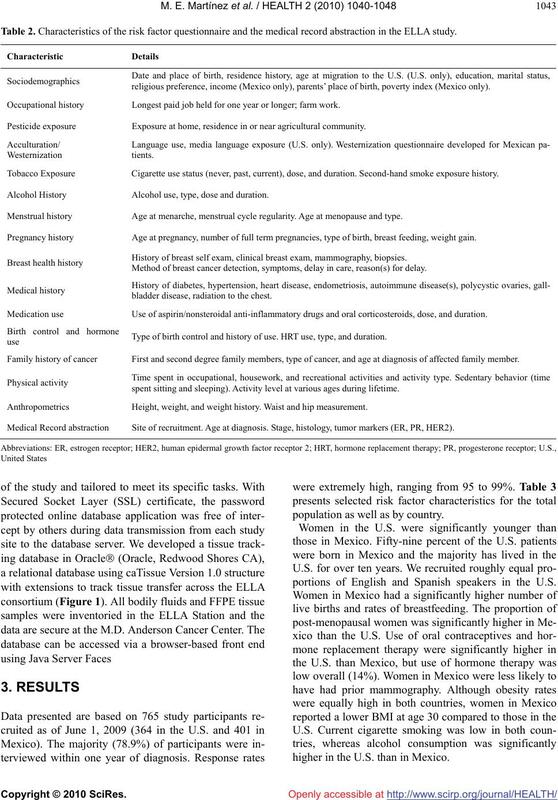 Epidemiology, Biomarkers & Prevention, 11(9), 795-800.
cancer risk in Hispanic and non-Hispanic white women. 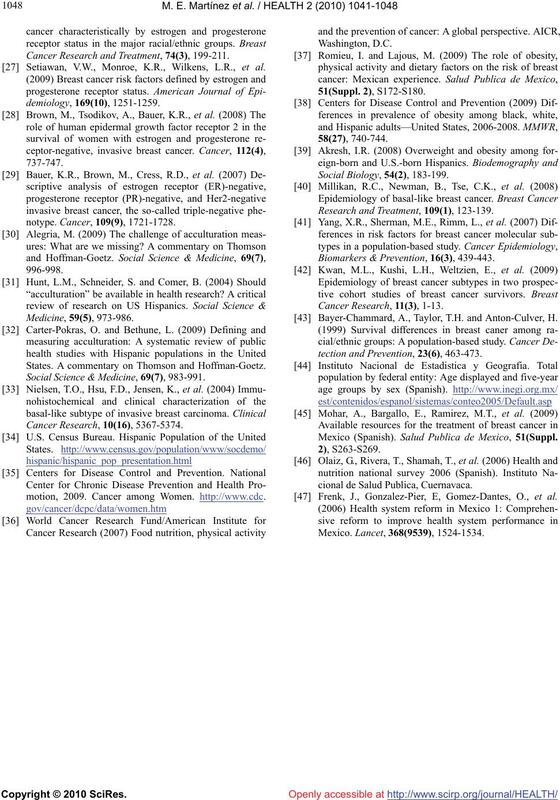 Breast Cancer Research and Treatment, 102(1), 85-101. Sweeney, C., Giuliano, A.R., Baumgartner, K.B., et al. Murtaugh, M.A., Sweeney, C., Giuliano, A.R., et al. 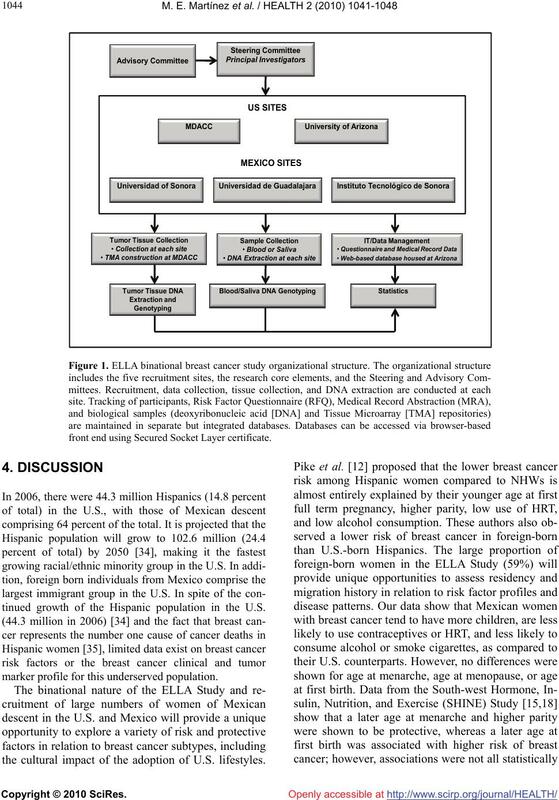 acculturation, and breast cancer risk in Hispanic women. National Academy of Sciences, 100(14), 8418-8423. Edition, Springer, New York, 255-276. 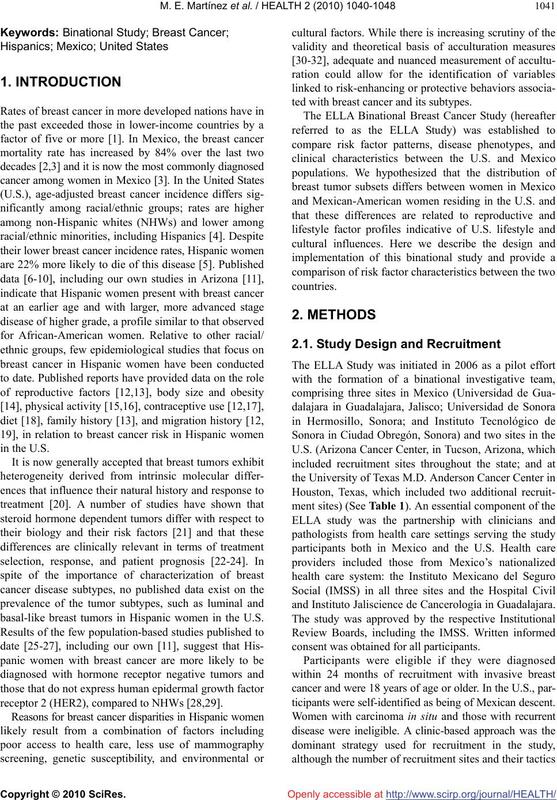 Breast Cancer Study. JAMA, 295(21), 2492-2502. Rakha, E.A., Elsheikh, S.E., Alekandarany, M.A., et al. 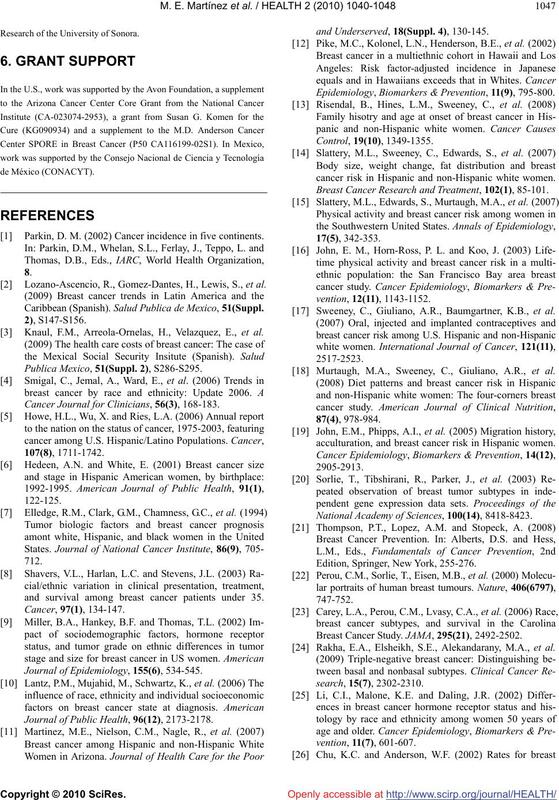 Cancer Research and Treatment, 74(3), 199-211. Setiawan, V.W., Monroe, K.R., Wilkens, L.R., et al. States. A commentary on Thomson and Hoffman-Goetz. Social Science & Medicine, 69(7), 983-991.
motion, 2009. Cancer among Women. http://www.cdc. Research and Treatment, 109(1), 123-139. Biomarkers & Prevention, 16(3), 439-443. Bayer-Chammard, A., Taylor, T.H. and Anton-Culver, H.
tection and Prevention, 23(6), 463-473. Mexico (Spanish). Salud Publica de Mexico, 51(Suppl. cional de Salud Publica, Cuernavaca. Frenk, J., Gonzalez-Pier, E, Gomez-Dantes, O., et al.